January 12, 2007 1 Comment GND.TO, SNE. I lost track of how many companies were showing LCD’s at CES 2007. Lot’s of no name Chinese companies have jumped into the fray, with their only differentiator being price. Sure, Sony (SNE) and others have the highest quality panels, but a large part of the growth in panels will be at the low-end of the pricing range. The result is The LCD Supply Chain gains importance as product is commoditized. January 12, 2007 1 Comment PC, SNE, TXN. Anyone walking around the floor of CES 2007 could clearly see that LCD has won, and Plasma Displays are dead. The plasma guys like Panasonic (PC) are fighting a rear guard action to extract returns on their sunk Plasma investment costs. Plasma will will ship fewer incremental panels as demand for large size flat panels explode, and absolute market share for Plasma will plunge. I don’t expect to see any additional investment by manufacturers in Plasma. January 2, 2007 19 Comments AAPL, AKAM, AMD, CMCSA, COMS, CSCO, CVC, GOOG, INTC, MSFT, SNE, T, TIVO, VZ. Prediction is an entertaining activity better suited for stimulating discussion than providing an absolute outlook on the future. Therefore, the bolder and more controversial, the better. Keep that in mind as you read and respond. November 13, 2006 Post a comment SNE. Now that we have Youtube we can experience Hardware pr0n in video, rather than just snapshots. Check out this YouTube Video of Japanese Engineers taking apart a brand new Sony Playstation 3. Jump to the 5 min mark to witness what pure engineering hardware lust sounds like in Japanese as these guys undress the cooling system of the PS3. November 6, 2006 5 Comments AAPL, CMCSA, CSCO, MSFT, SFA, SNE, TIVO. Microsoft (MSFT) just announced that on November 22nd the Xbox 360 will allow users to purchase and rent high definition television and movies. I made this call back in January of 2006, and repeatedly since then (search this site for Xbox IPTV). July 28, 2006 3 Comments AAPL, GOOG, IBM, MSFT, SNE. 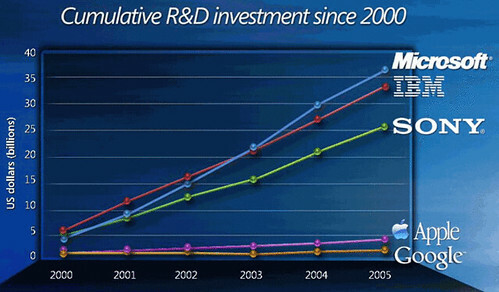 Paul Kedrosky highlights one slide presented by Craig Mundie at Microsoft Analyst Day that compares the cumulative R&D investment of Microsoft (MSFT) and Google (GOOG), among others. Two ways to look at this. April 27, 2006 2 Comments NFLX, SNE. As Godzilla thunders across Japan, the guardian monsters move to stop him. Baragon is the first to challenge Godzilla. Though he struggles valiantly, the burrowing reptile is no match for the overwhelming power of Godzilla. When Godzilla marches on Tokyo, the two remaining guardians, Mothra and King Ghidorah, combine their power in a final battle against the unstoppable juggernaut. Will Admiral Tachibana and the military be able to tip the scales in favor of the guardian monsters? Can Yuri stay alive long enough to tell the story? Can anything stop Godzilla? With all of the hype surrounding Blu-Ray and HD-DVD, you would think that Hollywood was trying to write a new Japanese B-movie script. First, we get the trash talk from Matsushita (Panasonic) indicating that reconcilliation is impossible, and “The market will decide the winner.” Then, rumors abound that Sony (SNE) plans to ship the Playstation 3 in November, complete with Blu-Ray drive and $399 price tag – never mind that no working Blu-Ray player is on the market right now. It isn’t clear how $399 is economically feasible given Toshiba is wrapping $100 bills around every HD-DVD player it ships out at a $500 ASP. And even this is shocking given their HD-DVD player is commodtiy IDE PC drive disguised as home electronics. I’m still sticking with the opinion that both formats win in different applications. This opinion appears to be echoed by Reed Hastings, CEO of Netflix Inc. (NFLX), during their latest quarterly conference call. In Q2, both HD DVD and Blu-ray are soft launching, in preparation for a larger retail push in Q4. We believe Microsoft (MSFT) sees studio support of HD DVD as very important to their game format battle with Sony (SNE). We also believe that X-box and Vista will support HD DVD more directly with every one of their product updates. Therefore, since neither Sony nor Microsoft will concede nor win in this format war for at least several years, there will be a protracted competition which will hurt the adoption of high-definition DVD, despite everyoneâ€™s best intentions to avoid a format war. There is, however, a practical solution. If all studios were to embrace both formats agnostically, consumers would be reasonably comfortable buying either format and presumably making their purchase decisions based on hardware, price and features. Studios have supported VHS and DVD for years, so supporting two formats is not something new. Embracing both formats is exactly what studios will do, and they will use the formats to price differentiate their product. The reality is that 10 years from now getting your media on a silly plastic disk will seem as ridiculous as…. watching a Godzilla movie marathon. Movies are going to be downloaded to your set-top-box/DVR/home theater PC. Online Gaming the Next Broadband Growth Driver? March 23, 2006 1 Comment SNE, V.
I’ve questioned in the past whether the US really wants broadband, and I think that the lack of a killer app, not availability, is what prevents widespread adoption. A comment made by a reader a keynote speech by Sony(SNE), and an article in the WSJ helped crystallize some thoughts I have had. China is regulating the amount of time children under 18 can spend playing online videogames. When China steps in to start regulating a runaway trend you can be sure it is starting to reach critical mass.